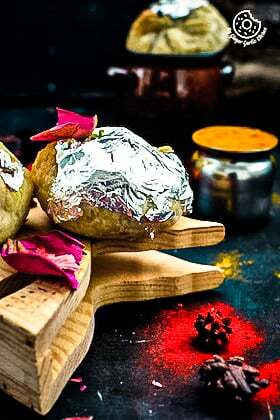 The Indian festival of “HOLI” is all about eating good food and playing with bright colors. Holi is a spring festival. It is also known as the festival of LOVE, festival of Happiness! I am away from home, and it’s been almost 10 years since I last played Holi. 10 years are indeed a long span of time, but I always try to make this festival special for my family—not with the colors, but with the colorful food. A Holi without the sweet stuff (called ‘Mithai’) is incomplete! All of those who know about Holi would agree with me here! 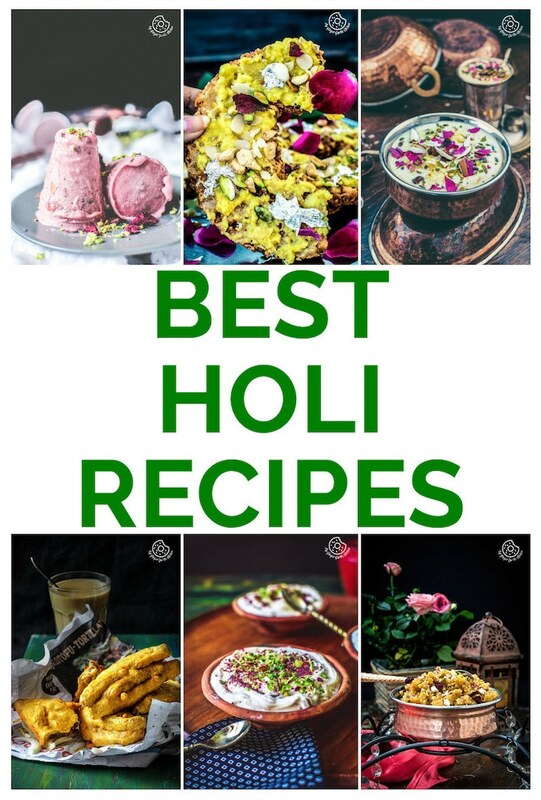 In the momentum of coming celebration, and keeping the spirit alive, I have compiled a list of 15 Healthy & Modern Holi Recipes, which should help you to decide on what to cook this Holi. All of these are the healthier versions of traditional Indian Sweets. Try these simple Holi Recipes. They would definitely make a huge place in your loved ones’ hearts. These sweets are just perfect to make this auspicious occasion so memorable!!! Almond Rose Rabri with a dash of saffron is a rich and creamy milk dessert, Nut fans this is a delight for you! When you add saffron to any dish, it not only gives it a bright color, but gives a nice aromatic rich flavour too. Rose water and dried petals makes it impeccable. This is real winter dessert, as saffron is good for mild cough and cold, and gives you total warmth, which is all you need. Blueberry Mango Froyo Marble Bars are lighter, and healthier option than regular creamy ice cream bars. This recipe includes blueberry lassi, and mango lassi. Sabudana or sago/tapioca pearl has carbohydrates, and when you combine with milk, carrots and nuts, this pudding gets packed with full of energy. Adding saffron to this recipe, gives it a nice color and aroma, which makes it a deliciously desirable dessert. Cheesy blueberry halwa is prepared with semolina, blueberry, coconut, and mozzarella cheese. This recipe is a little twist to regular suji halwa. Indulging Coconut Mango Panna Cotta is a classic, creamy, rich, and sweetly tangy dessert. This deliciously beautiful dessert has a fruity mango flavour which is hard to resist. Indulging Coconut Mango Panna cotta is a vegetarian, and a very smooth velvety dish made with mangoes. Pineapple Coconut Rabri is an Indian style dessert, and a totally awesome one. Traditionally rabri is prepared by evaporating full cream milk to half, but I am using evaporated milk for a quicker version. Coconut Peas Peda is a combo of green peas, coconut, and non-fat dried milk (khoya).These are soft, buttery, creamy, and with a little bit nutty. They would just melt in your mouth. Khoya Puffs are a newest modified version of very famous Indian sweet ‘Gujia’. You can call these Cutting Edge Gujia! Instant Coconut laddu is a quick and elegant dessert recipe; which is prepared with just 3 ingredients; desiccated coconut powder, condensed milk & cardamom powder. These beautiful white laddus are such a delight that just melts in mouth, and with a taste that no one can resist. Exotic Pumpkin Tofu Halwa gives a nice aroma of cardamom, with slightly roasting flavor of tofu, and creaminess of pumpkin. Rose Flavored Vermicelli Pudding is a very popular Indian dessert. This is prepared with thin vermicelli milk, sugar, and rose water. I am using pre roasted fine vermicelli, which is easily available at any Indian grocery store. Candied Sago Pudding With Blueberry Sauce is a super tasty, beautiful, and excellent pudding. Made with sago, milk, sugar and flavoured with blueberry sauce. Chocolate Twisted Sankranti Laddo are totally worthy of a healthy breakfast, dessert or as evening snack. You will always feel fuller after having them. Peanut coconut jaggery bars (chikki) are traditional Indian sweets. 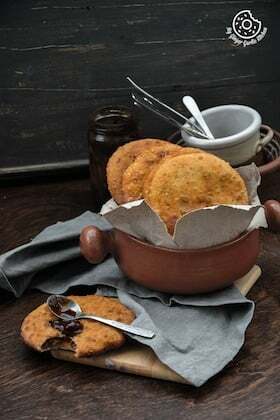 I made this traditional recipe with a little twist by adding palm sugar to it. Peanut coconut jaggery bars are very nutritious, delicious and very easy to prepare.